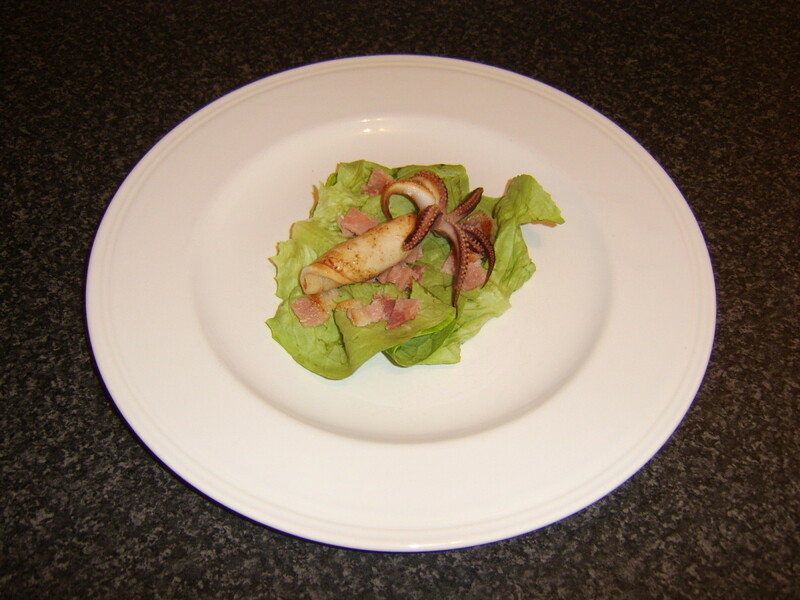 Pan-fried calamari (squid) on a bacon-and-lettuce salad is just one of the recipes you will find on this page. Calamari do not require a lot of cooking. 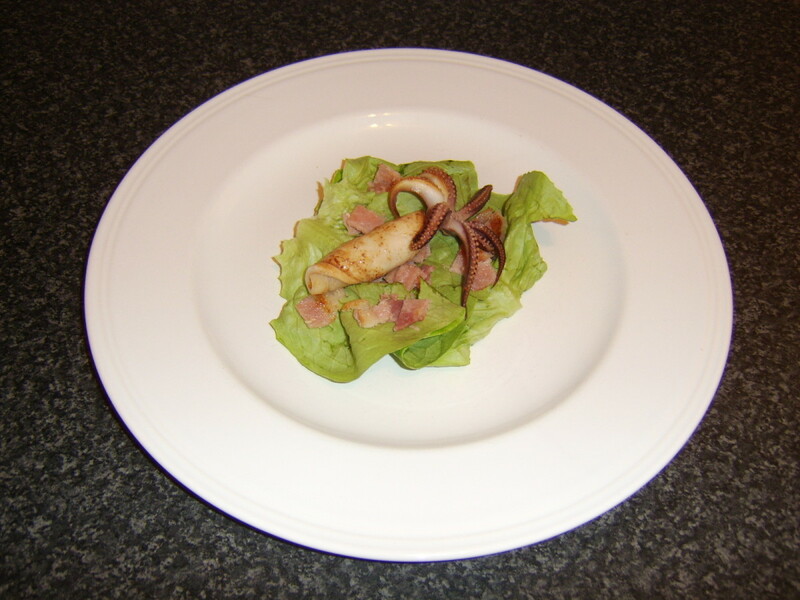 Calamari should be cooked very quickly, otherwise they are likely to become tough and unpalatable. There are, however, a great many ways in which calamari can be prepared, cooked and served, and the small, deep-fried calamari rings you may have seen are by no means the only way to enjoy this delicious cephalopod. 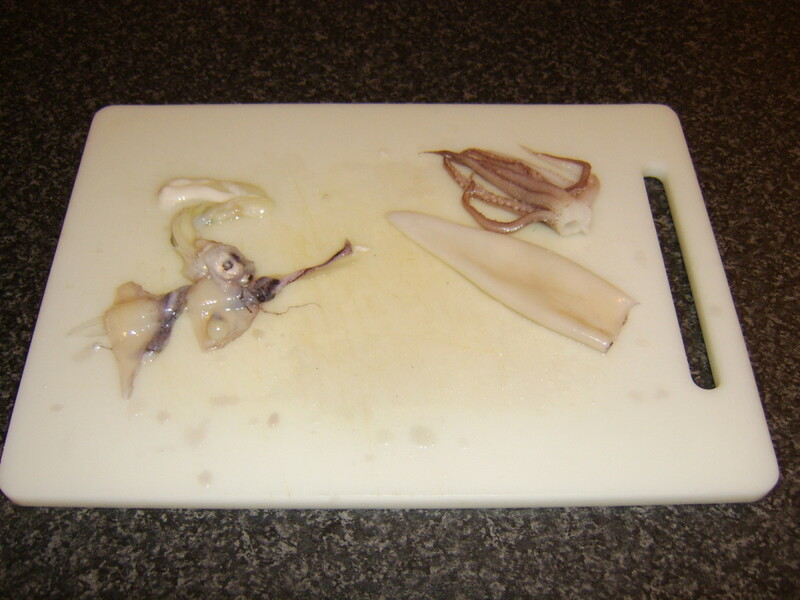 This page first shows you how to prepare calamari for cooking, and then provides cooking and serving suggestions, allowing you to enjoy this delicious and underrated seafood ingredient to the full. A great many types of squid from around the world are called "calamari," often because "calamari" is thought to look more appealing on restaurant menus than "squid." The calamari used on this page are exclusively the small ones from the Pacific Ocean, meaning that a great many people will have access to them only in their frozen form. Frozen calamari are not expensive, but their popularity as bait with saltwater fishermen means that some care has to be exercised. 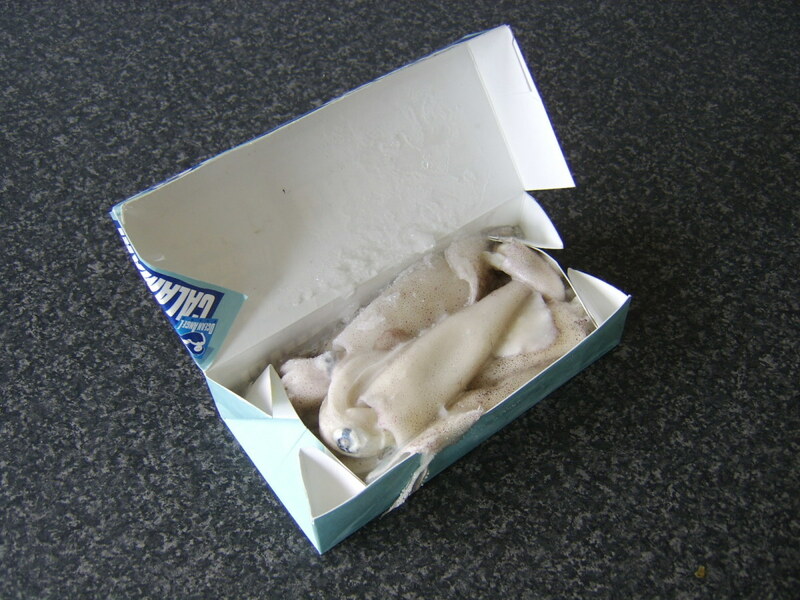 Calamari are sold in boxes like the ones pictured here both for human food and as fishing bait. 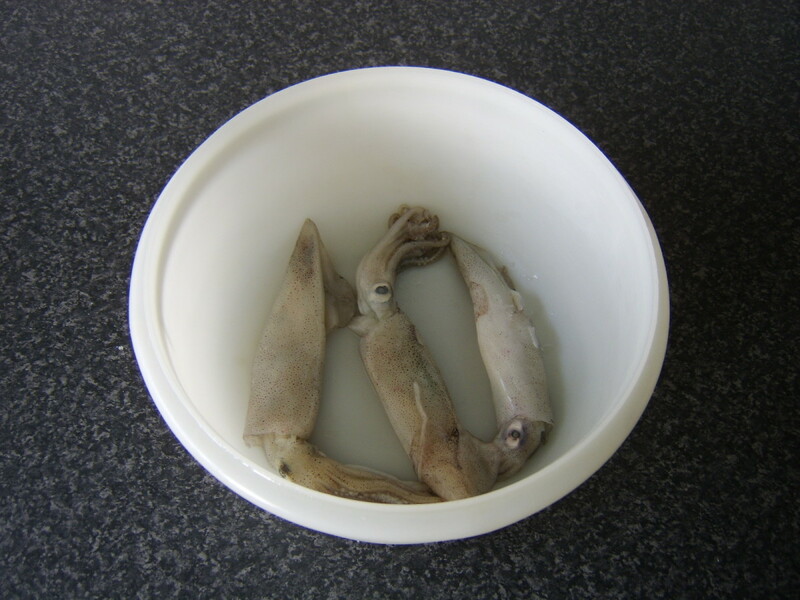 A box of calamari bought from fishing tackle shops or stores should have written on it, "Not fit for human consumption." Heed this message, as calamari intended for bait are likely to have been frozen for a long time and perhaps prepared in conditions which do not take full account of hygiene. 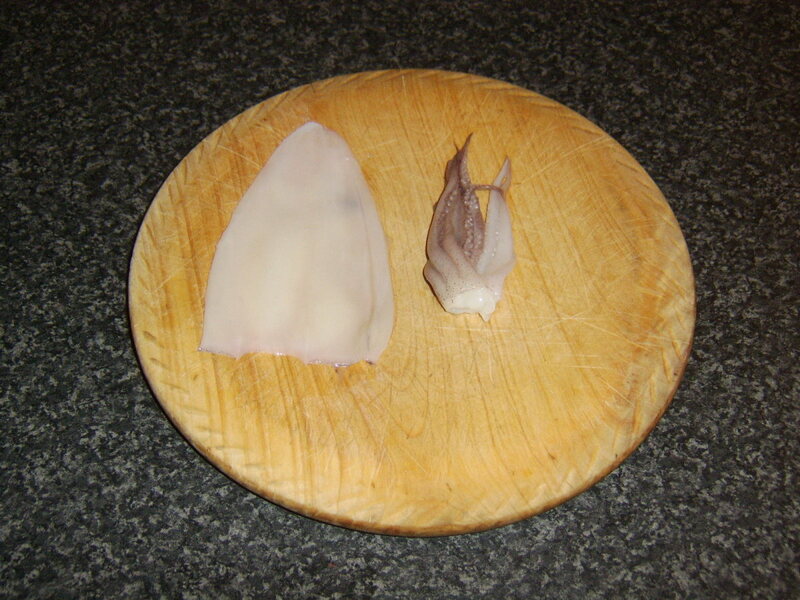 Calamari for food can be found in larger supermarkets, particularly speciality ones, such as Chinese. 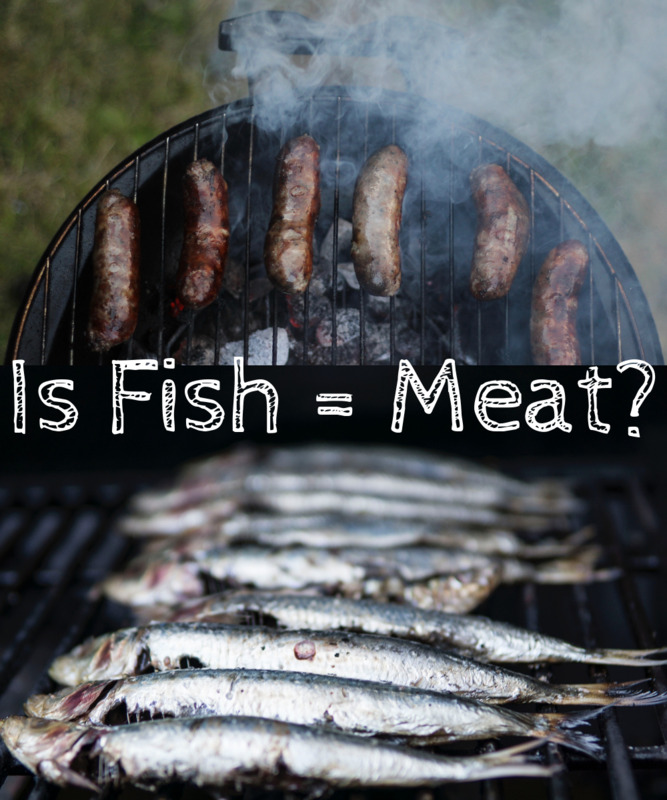 They should always be defrosted completely at room temperature—or in a bowl of cold water, which will help speed up the thawing process—prior to being prepared and cooked. The precise way in which calamari are cleaned and prepared will vary slightly dependant upon how it is ultimately to be cooked. The initial stages of the procedure should be the same, however, in almost all instances. Hold the body of the squid in one hand and the head in the other. Pinch gently between the head and the body and apply gentle but steady pressure to pull the head and guts out of the body core. Set aside. There is a plastic-like "feather" running the length of the body. Pinch this at the wide end of the body, pull free and discard. Remove the thin, membraneous skin from the body by rubbing with the ball of your thumb. Gently peel the wings from the body (though do not discard, as they are perfectly edible.) Pinch the pointed end of the body between thumb and forefinger and very gently squeeze out any remaining innards. Wash under running cold water. 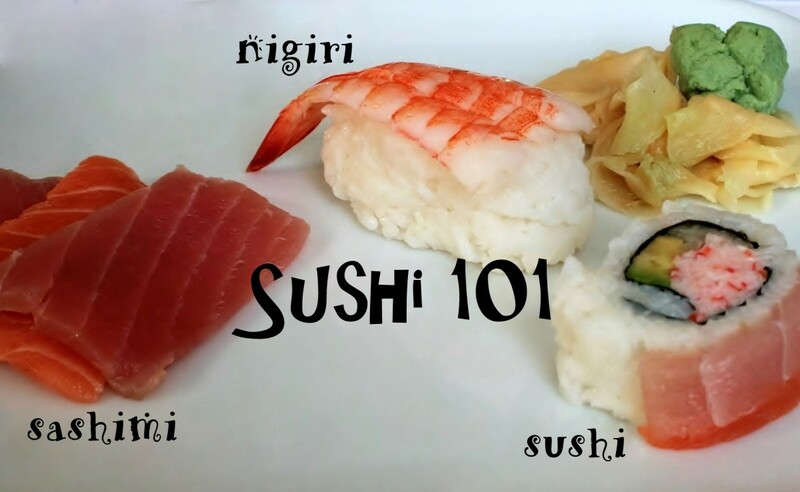 Whether the body is now sliced into rings or not will depend on the recipe being prepared. The head and innards should be laid flat on a chopping board. Carefully cut just above the eyes at the tentacles end, trying not to pierce the eyes. Discard the eyes and innards. 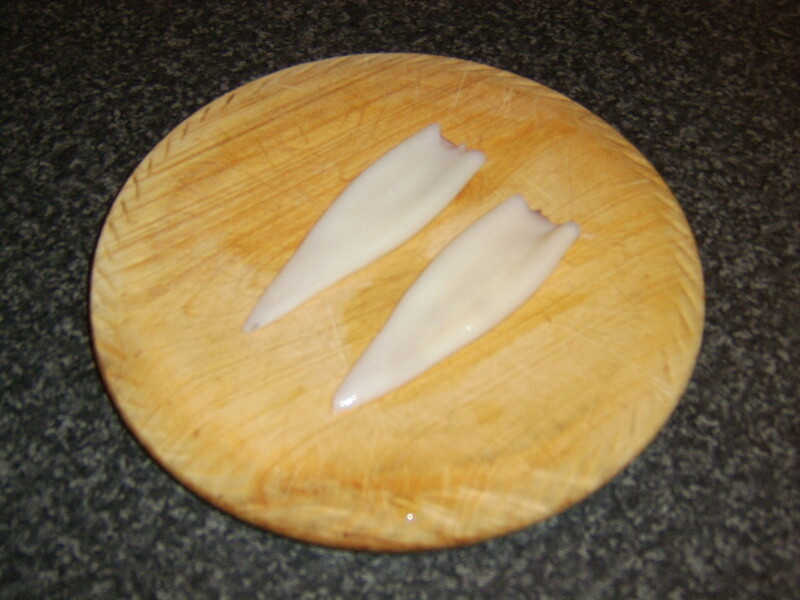 Pull of and discard the two long white tentacles. The beak should be removed by gently squeezing the base of the tentacles and pulling it free. The excellent video below shows and summarises this process in full. The main body and tentacles of the calamari should be prepared as above. A pair of kitchen scissors are best for cutting down the length of the body and opening it out flat as shown. 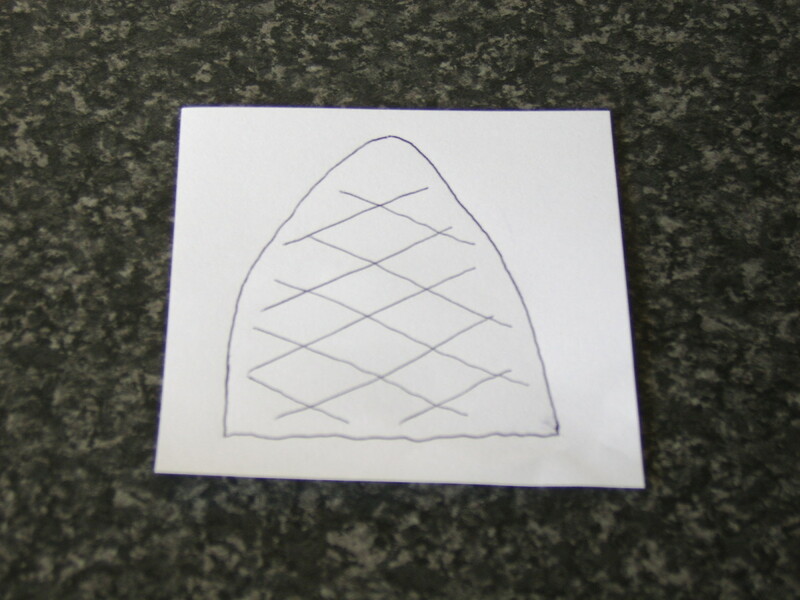 A very sharp knife is then used to make diagonal scores on the body as can be seen best in the diagram. Note that virtually no pressure should be applied as you do not want to cut all the way through the delicate flesh. Wash and dry the lettuce leaves and arrange them on a plate as a bed. Put the bacon under an overhead grill to cook for a couple of minutes each side. 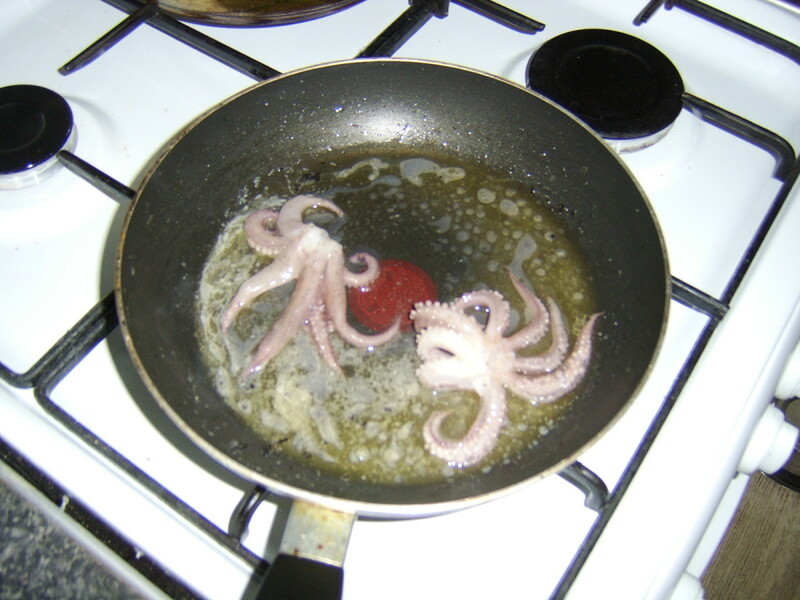 Add some oil to a pan and cook the calamari tentacles for about a minute before adding the body on the scored side. Season with salt and pepper. Turn after thirty seconds and the scores will cause the body to roll up as it finishes cooking. Serve as shown above to create the perfect impression of a whole calamari. Put two (unmedicated!) wooden toothpicks or cocktail sticks in to a bowl of cold water to soak for at least ten minutes. Pour the tomatoes in to a medium saucepan. 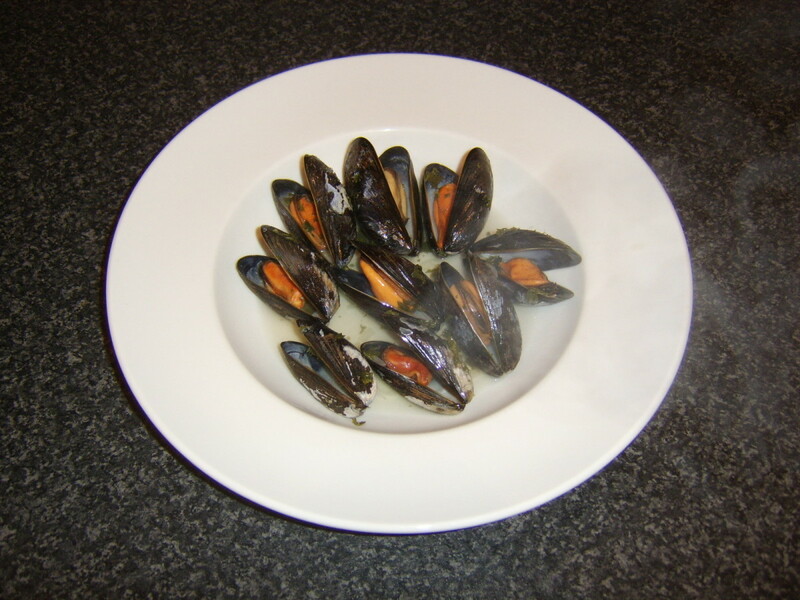 Bring to a simmer and continue to simmer for fifteen minutes, stirring occasionally. This should see a lush sauce start to form. 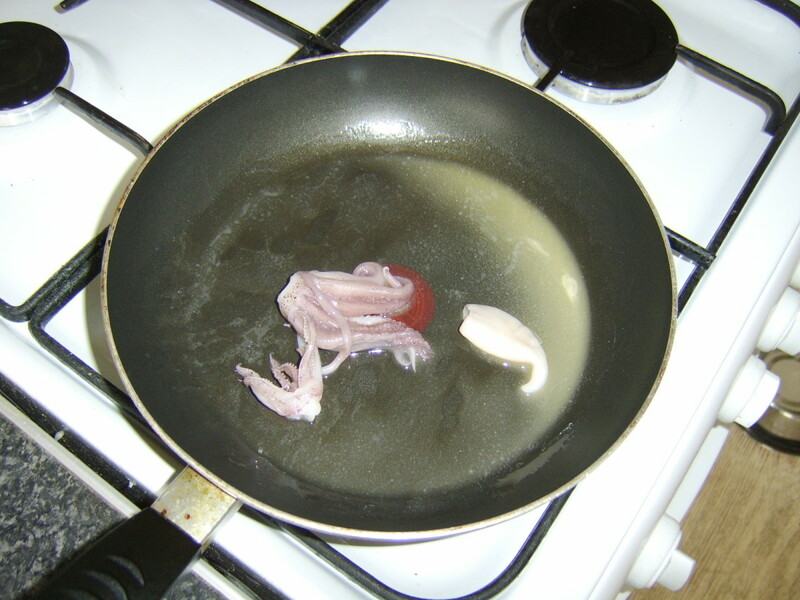 Melt a little butter in a frying pan and stir fry the calamari tentacles and wings for a couple of minutes. Remove to a plate to cool. 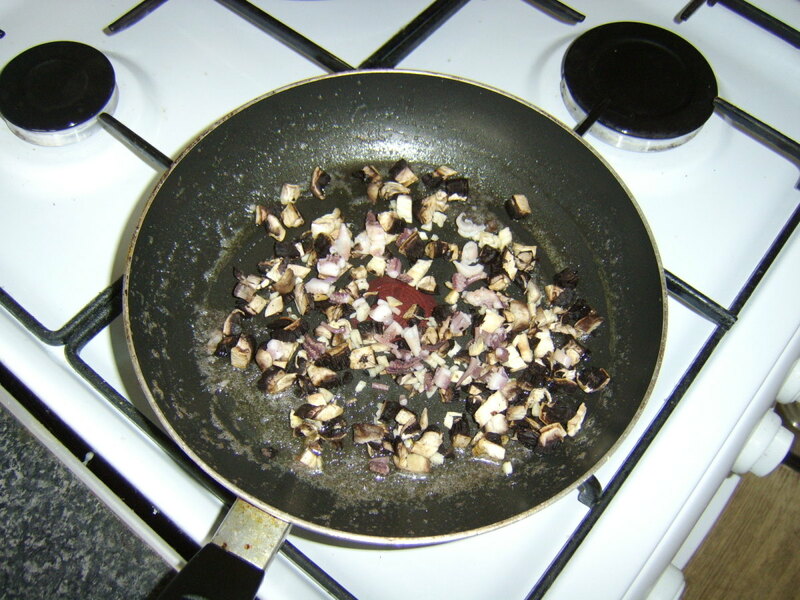 Dice the mushrooms and garlic and stir fry in the same pan (more butter may be required) for two to three minutes. Finely chop the calamari tentacles and wings, mix with the mushroom and garlic, season and allow to cool enough to handle. Very carefully, use the stuffing mixture to stuff the calamari bodies. This is best done by hand. Do not overstuff or the bodies may burst during cooking. Use the cocktail sticks/toothpicks to loosely seal the calamari at the open end before placing them carefully in to the simmering sauce. 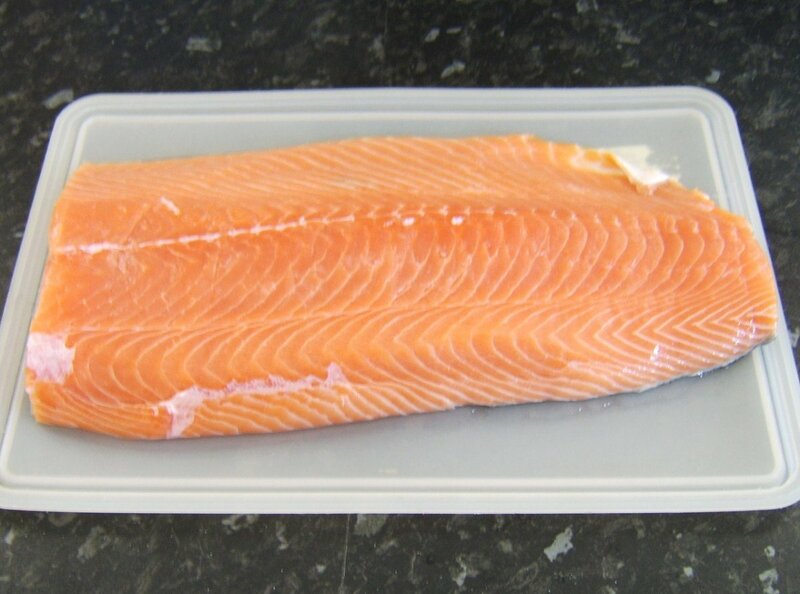 Cover and allow to cook gently for five or six minutes. Carefully remove the cocktail sticks when the dish has been plated and garnsih with the chopped parsley. 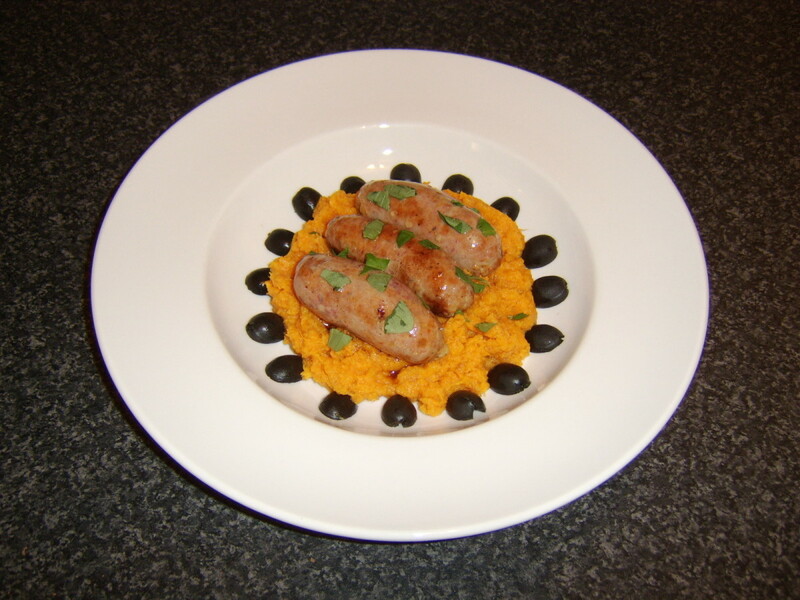 This recipe is perfect as a starter but the quantities can easily be increased to serve it as a main meal, perhaps with a green leaf salad and/or some fresh, crusty bread. 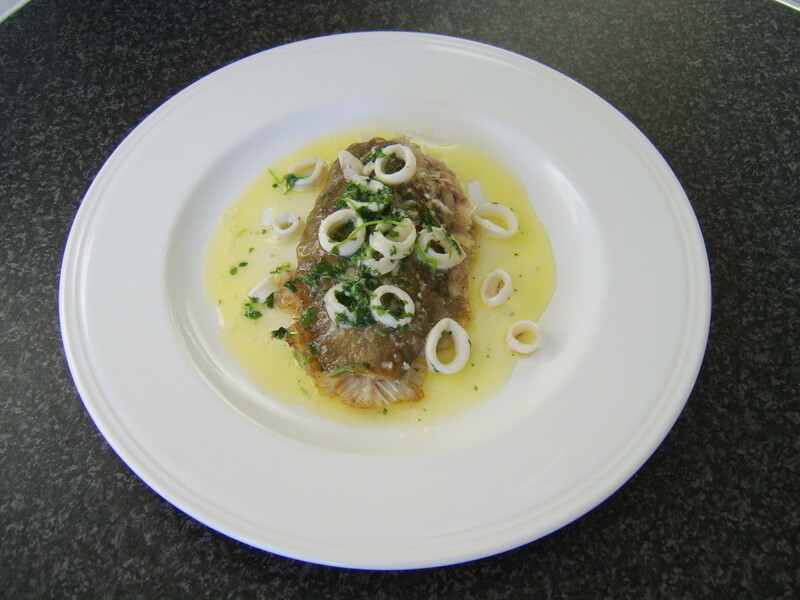 Calamari can make an excellent accompaniment to other forms of fish and seafood, as these next two recipes will show. In this first recipe, it forms part of the sauce for a pan-fried dab. The dab should be gutted and the fins removed with a pair of scissors. 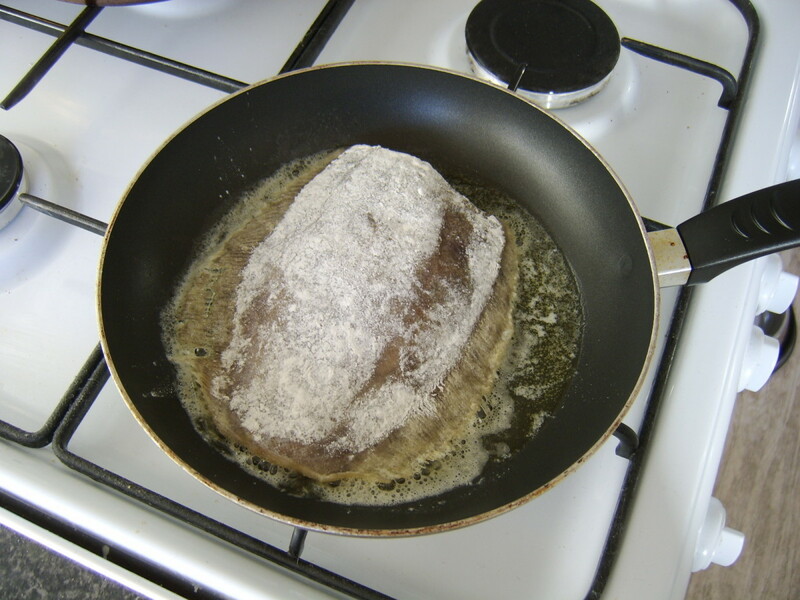 Melt a little bit of the butter in a frying pan, pat the dab on both sides in seasoned flour and fry for three to four minutes over a medium heat until cooked. Transfer to a heated plate and cover with foil to keep warm. Wipe the pan with kitchen towel and melt the remainder of the butter. 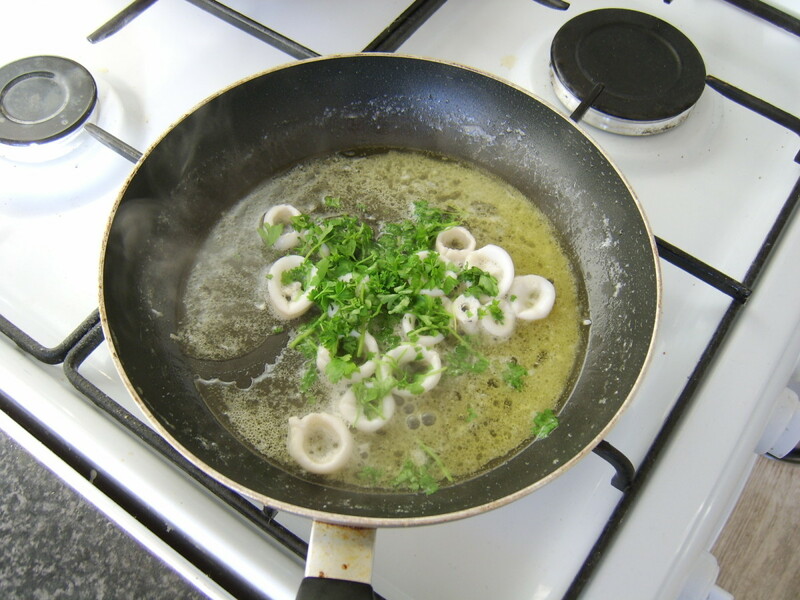 Slice the calamari in to rings and add to the pan with the lemon juice. Cook on a fairly high heat for two minutes. 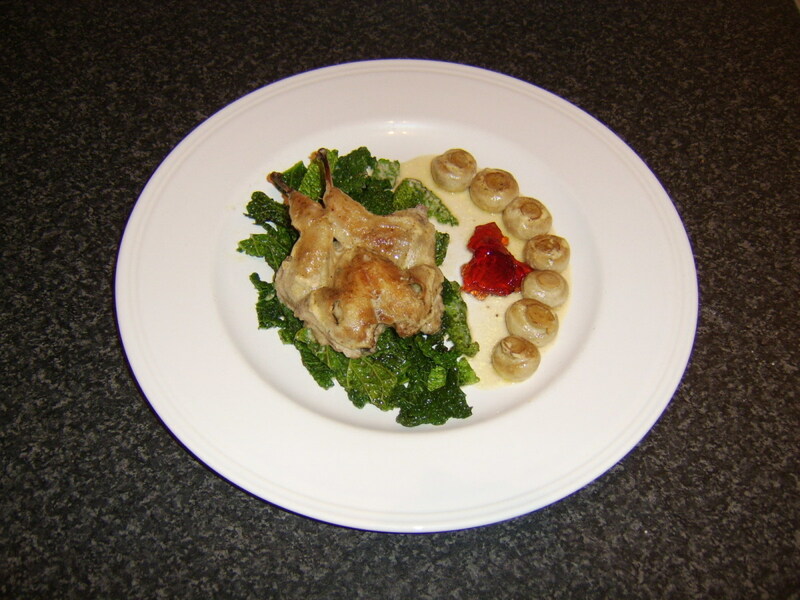 Season, stir through the parsley and spoon over the dab for service. Preheat your oven to 375F/190C. 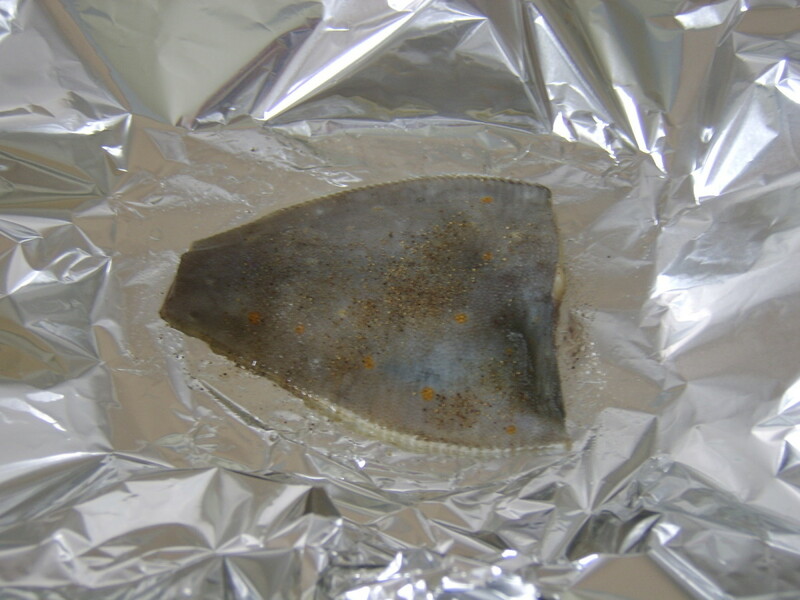 Wash the gutted plaice and sit it on a sheet of tinfoil. Add a little butter and season. 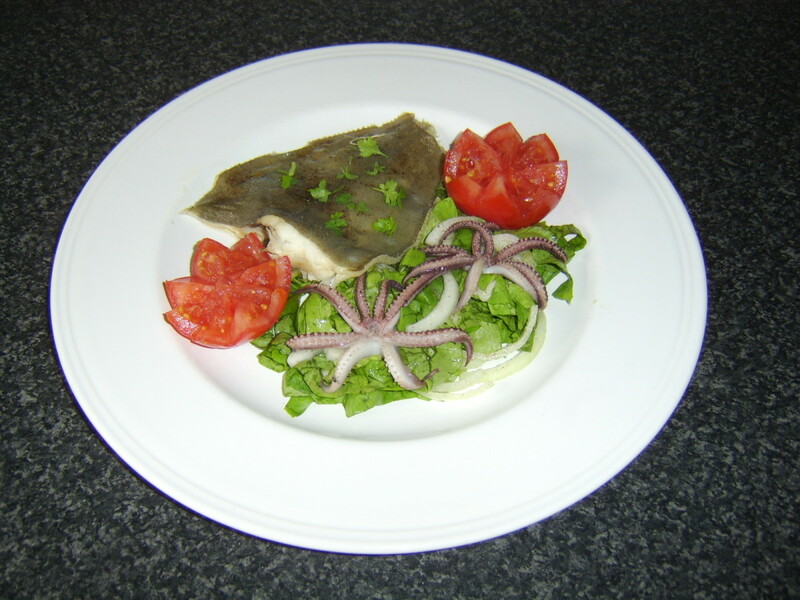 Wrap the plaice securely but loosely in the foil, place on to a baking tray and in to the oven for fifteen minutes. Add a little more butter to a small frying pan. Put on to a medium heat and stir fry the calamari tentacles for two to three minutes. Thinly slice the onion and shred the lettuce. Mix together, season and make to form a bed on a plate. 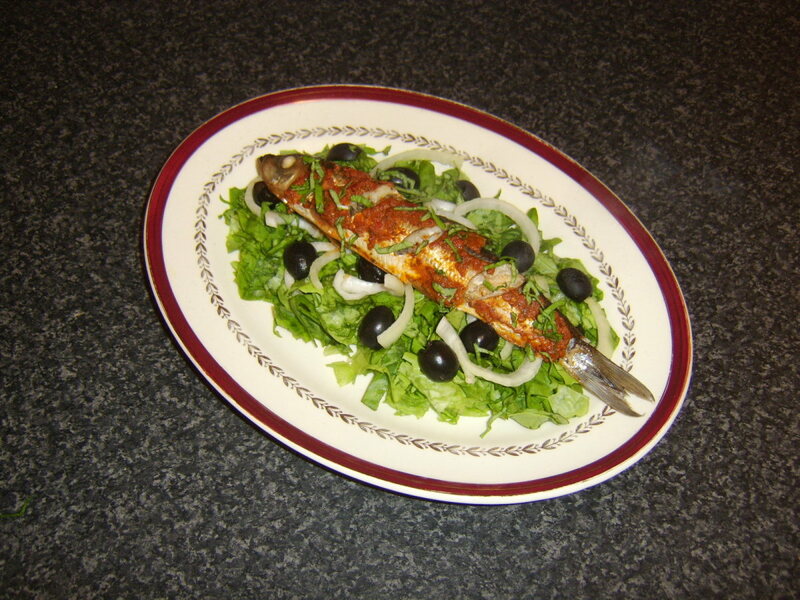 Add the plaice and the calamari tentacle and half the tomato as a final garnish. Are You a Fan of Calamari? 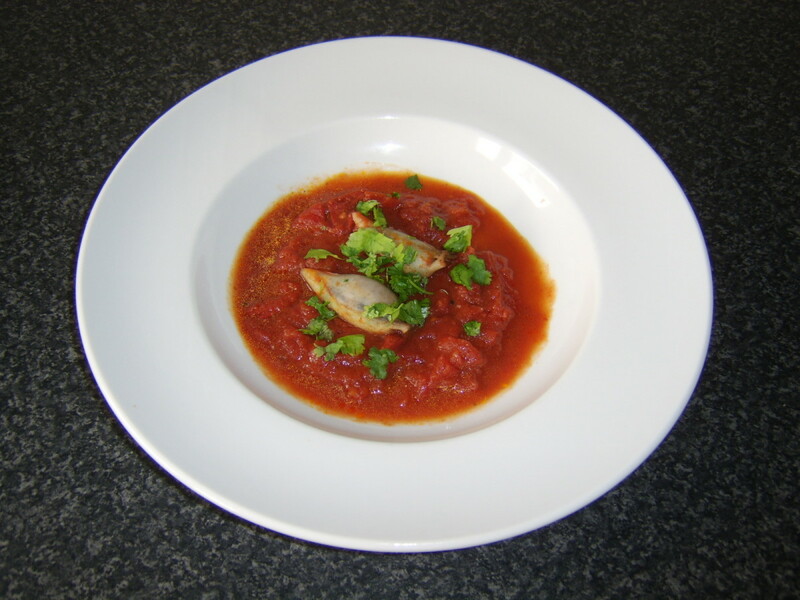 Hopefully this page has provided you with some new ideas for cooking and enjoying calamari. Thank you for taking the time to browse through it. Any comments or feedback which you have may be left in the space below. Thank you very much, David. I share your love of calamari and wish more people would actually try it, rather than be put off by its appearance and the simple concept. 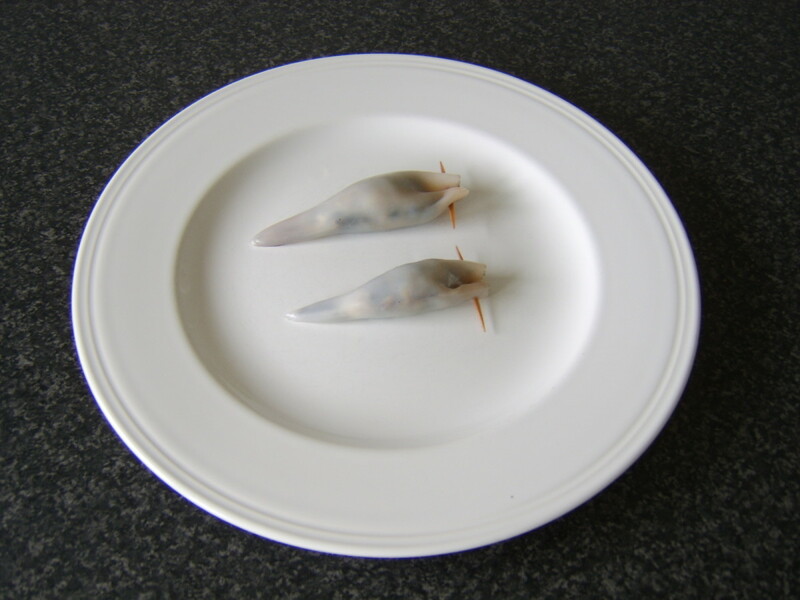 It is actually also one of my most favoured sea fishing baits, so I win both ways! 7 years ago from Southern Ca. Go for it borge_009. It is not difficult and is really tasty. Thanks for the visit and the comment. wow. I only know how to eat it but after reading this maybe I will try t cook one. Thank you, Ancilloti. I very much hope you do try it. There are so many ways in which calamari can be prepared to suit different tastes that anyone who likes fish and seafood is sure to find one they enjoy. I must confess that thinking about eating Calamari gives me a certain disgust ... but you explained it well and looking at the recipe she prepared the dish until it looks a bit unappetizing. Maybe I'll try the recipe sometime. Thanks for sharing! Up and useful!